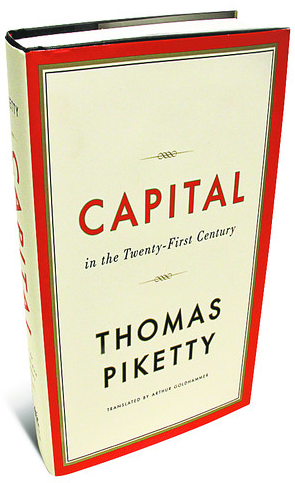 I just finished reading Capital in the Twenty-First Century by Thomas Piketty, the economics work du jour that has been called the most important book of the century. Rather than take the time to collect my thoughts and organize them into a coherent, sensible review, I decided I’d just dump my initial impressions in a scattered fashion and let you wade your way through. I’m not sure why anyone would even by interested in what I have to say about the issue (as opposed to people much more informed than I am), but this is the Internet and being unqualified never stopped anyone before! Still, inequality is the central theme of the book, and Piketty paints a harrowing portrait. But the full picture he creates is not just one of the present and recent past. He goes all the way back to the eighteenth and nineteenth century and illustrates a few key points. The first is that inequality decreased substantially throughout the twentieth century. This is kind of obvious, but his next point is crucial: This decrease was essentially a historical accident. It was the result of a global Depression and two world wars of unprecedented scale, which destroyed a ton of wealth* and, as Piketty puts it, “wiped the slate clean” for the generation after World War II. *The way this happened was not as obvious as you might think. Some of it was just the physical destruction of the wars, sure, but it also came from nationalizations caused by the war, loss of European colonies, and the huge national debts and subsequent inflation that followed. Piketty explains it all better than I could. In other words, the decrease in inequality wasn’t some natural result of the forces of capitalism, but the legacy of specific disasters we’re only now emerging from.